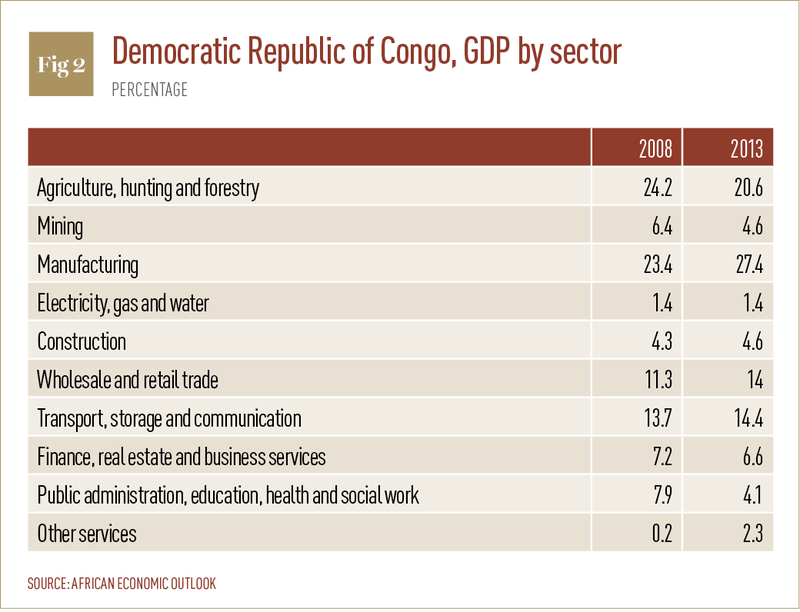 Nestled within Central Africa, the Democratic Republic of Congo, one of the continent’s largest democracies, has enjoyed tremendous economic growth over the past three years. Under the leadership of President Joseph Kabila and Prime Minister Augustin Matata Ponyo Mapon, the once war-afflicted nation is now becoming a beacon of prosperity. Throughout the massive nation, approximately the size of Western Europe, development is evident as the middle-class continues to rise, infrastructure projects develop and investors looking for sustainable returns come by the droves in search of opportunities. As this growth compounds, cityscapes throughout the country are beginning to take shape, while the middle class is growing at an unbelievable rate. The livelihood of Congolese citizens is improving and this change is directly translating into improved human development indicators, as well as higher rates of education and healthcare. Known for its abundance of natural resources, estimated to be worth more than $24trn, the nation has progressed significantly as its economy has diversified to expand its vast agricultural and human capital potential. The meteoric rise of one of Africa’s largest and most prosperous nations has been underway for years. Underpinned by strong governance, a diversified economy and an ambitious modernisation plan, the nation of 70 million is on the cusp of an unprecedented emergence as an African superpower. The rise of the Democratic Republic of Congo signals an evolution of the continent as a whole and offers a look at what Africa can come to represent. In addition to the impressive growth figures, other macroeconomic indicators show encouraging signs of progress. The nation’s currency, the Congolese franc, has remained stable, the national wealth has doubled due to more efficient tax collection, and, perhaps most importantly, public and private investment has increased significantly. To promote sustainable economic growth, Ponyo and President Kabila have worked closely with members of the international community using evidence-based analysis to enact legislation and improve the country’s business climate. These changes range from creating transparent processes, minimising bureaucracy when starting businesses and creating anti-corruption programmes. The changes, among many others that are still in progress, have been instrumental in creating an investor-friendly environment and opening up numerous sectors throughout the country to private investors. Kabila’s latest example of creating a more favourable business climate can be seen in his efforts to tighten controls on granting mining licenses to prevent abuse and fight corruption. Improper control mechanisms have led to underdevelopment that has cost the country in tax revenue and in the livelihood of citizens throughout the mineral-rich portions of the nation. He later added that some of the mismanagement “had negative consequences for the improvement of the population’s living conditions”. In July 2014, the Democratic Republic of Congo earned full membership to the Extractive Industries Transparency Initiative (EITI), the global organisation promoting good management of oil, gas and mineral resources. “Despite all the challenges facing the country, the Congolese people have been working together to bring transparency and accountability to the management of their natural resources”, said Clare Short, the group’s chair. Diversifying the economy and developing human capital have both been a hallmark of Ponyo’s campaigns. 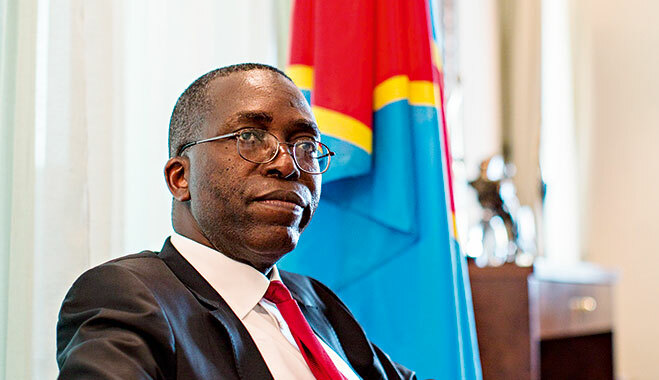 “While the country is very wealthy in natural endowments regarding mineral resources, it is imperative to diversify beyond this wealth alone to propel the Democratic Republic of Congo to a state that can compete economically on a global scale”, he said. Mining, for example, has attracted foreign investors from the US, South Africa, India and Turkey, which in turn, has fuelled growth within supporting sectors such as banking, digital commerce, and mobile services. 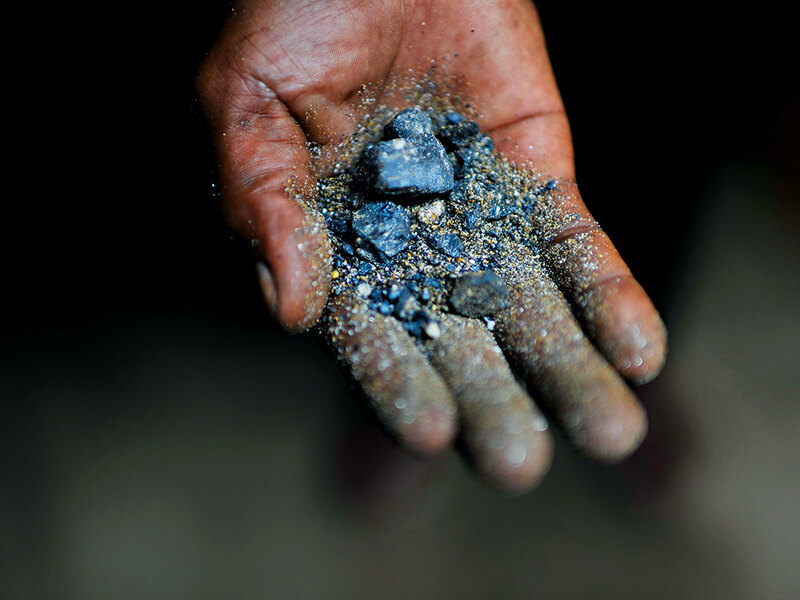 The Democratic Republic of Congo possesses world-class quantities of copper, diamonds and coltan, a dull, black mineral used in virtually every electronic device. “Building a strategic vision for long-term development requires sound political leadership, tireless reform efforts aimed at reinforcing the quality of the administration and vital institutions, and adhering to the rules and practices of good governance regarding our natural resources”, said Ponyo. Already a vital industry throughout the nation, agriculture contributed 20.6 percent to the country’s GDP in 2013 (see Fig. 2), but Ponyo is seeking to boost the sector even further. His aim is to provide the Congolese ample opportunity to create an agricultural sector unrivalled in Africa. By using the nation’s water, land and energy resources, the Democratic Republic of Congo can develop an industry of commercial farms offering fishing, livestock and vegetable production, connected to a coherent network of production and food distribution. Strategic investments and planning can potentially propel the nation’s economy even higher by fortifying the export market, while also helping the fight against hunger and malnutrition throughout the country. These investments, both by the government and the private sector, will provide thousands of jobs bring broad education to the masses and enable a generation of Congolese to develop and become self-sufficient. Earlier this year, the country hosted a conference in Kinshasa to address the role of agriculture to the growth of the continent as a whole. The conference – called Towards an Inclusive Growth: A New Vision for Africa’s Agricultural Transformation – brought together more than 300 people from across Africa, Europe and the US. Attendees included entrepreneurs, financiers, officials, donor funds, NGOs, foundations and farmer organisations. To support agriculture and encourage private-sector participation, Ponyo developed and launched a nationwide programme known as the National Agricultural Investment Plan (NIPA). NIPA’s main objectives are ensuring food security and developing the agri-business sector. Its first project will be the development of 16 large agro-parks. “The agricultural sector is where we can have the most significant impact on the population”, said Ponyo. 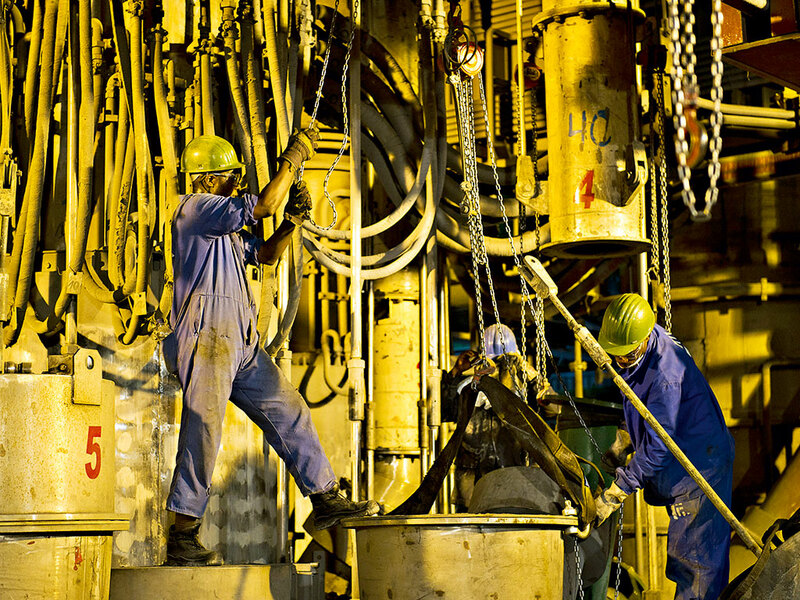 As the Democratic Republic of Congo looks to capitalise on its economic momentum, the nation’s energy sector is attracting the attention of international investors especially as its large-scale mining and industrial sectors continue to see significant growth. Paramount to the energy future of the Democratic Republic of Congo and the African continent is the Inga Dam Project, which is one of the largest infrastructure projects ever undertaken. The centrepiece of the project, the Grand Inga Dam, will be the world’s largest hydropower project and is an instrumental part of Africa’s future energy strategy. The dam has the potential to generate 38,000MW of energy at a cost of $80bn. It will help power South Africa, Botswana and Angola, and will ultimately be able to export power to Europe. The first part of the project, Inga III, will top off at a nameplate capacity of 4,800MW. In 2013 the US formally expressed interest in joining the project and is currently engaged with foreign counterparties as studies are being conducted. Rajiv Shah, the Head of the US Agency for International Development (USAID), visited the site of the future dam in 2013 with Ponyo and pledged financial aid to help develop the project. After visiting the Inga site, Shah remarked that in addition to seeing progress in building the country, his visit was met with numerous positive signals in terms of peace and the promotion of good governance. “The reforms in the electricity sector are signals that reassured USAID and other partners to join this project”, said Shah, who welcomed the significant progress made to improve the business climate. Shah also encouraged the nation’s leadership to stay on the path of reform and substantial innovation to attract more external partners for large-scale projects. While the amount of money to be earmarked from the US to support the Inga Dam project is still being negotiated, officials note that the task will have support from both the public and private sectors. According to Eric Mbala, Head of the Congolese National Electric Company (SNEL), the development work for the Inga III project will begin in October of 2015. Kabila has vowed to continue guiding the Democratic Republic of Congo into the next phase of development by enforcing good governance and seeking to create a better environment, both for the Congolese people and foreign investors. Seeing the need to make quick and long-reaching reforms to unite and inspire the country following national tragedy and civil strife, Kabila and his trusted advisors began to rebuild the fabric of the nation by creating a framework to help facilitate economic growth, improved welfare for the Congolese and a national identity that would help drive these changes forward. The efforts to provide quality healthcare, education, electricity and infrastructure to meet the everyday needs of the people serve as the greatest task for Kabila and his team of leaders. 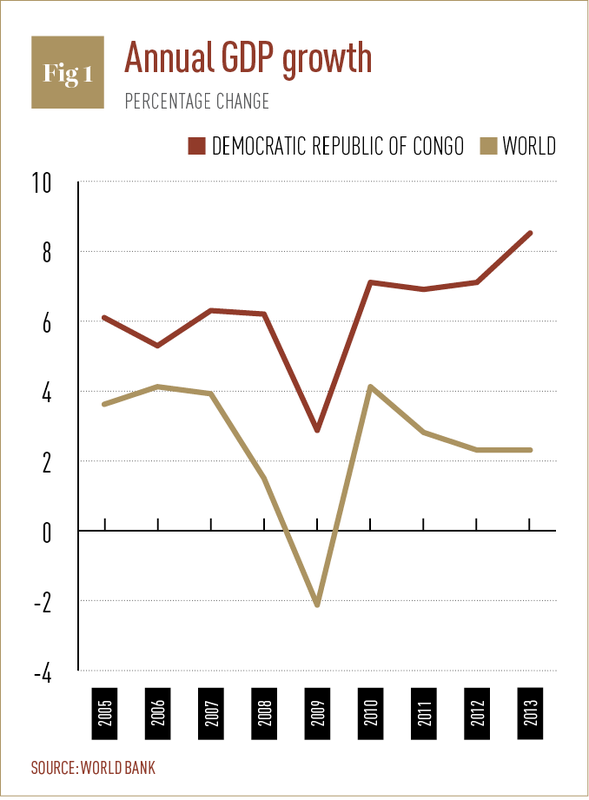 Under this framework, entitled Les Cinq Chantiers de la RDC (The Five Pillars of Congo), Kabila developed a long-term plan to improve domestic welfare through modernisation efforts, improve the country’s trade policy with foreign governments and boost domestic investments and capital flow to his country. Improving infrastructure, education, electricity, higher employment and housing are the key components of the nation’s modernisation and long-term growth strategy. Under the Les Cinq Chantiers framework, Kabila also vowed to improve the infrastructure of the nation. In perhaps one of the most prolific changes to turn around the failing commercial aviation industry, he encouraged the creation of new airlines to fill the quickly growing demand for cost-effective, yet safe aviation options. From this idea, and the vision of businessman George Forrest, came Korongo Airlines. In a partnership with Brussels Airlines and its parent company, Lufthansa, this airline will help fill a gap in the Central African aviation industry and help overhaul the nation’s growing industry. Following the creation of this airline, Kabila’s work resulted in discussions with Air France to partner with local airlines to create a pan-African network based in the Democratic Republic of Congo. Acknowledging the nation’s commitment to aviation, Ethiopian Airlines, the second-largest air carrier in Africa, opened a hub in the country’s main airport, N’Djili Airport. According to the IMF, in recognition of the need for better governance, many resource-rich countries in Sub-Saharan Africa such as the Democratic Republic of Congo have made a great deal of progress in the quality of their institutions over the past years. In fact, over half of the natural resource providers have improved their World Bank Worldwide Governance Indicator ratings on rule of law and corruption, and about 40 percent of these countries have improved their ratings on government effectiveness. Perhaps one of Kabila’s greatest achievements, however, was choosing a tremendously capable prime minister in Matata Ponyo Mapon. Formerly the nation’s minister of finance, Ponyo has become a popular figure, garnering tremendous praise both within his country and the international community. As a technocrat with the ability and passion to bring change to the nation, Ponyo, a firm believer in stability and the private sector as the key to growth nations, has worked to encourage free enterprise throughout the Democratic Republic of Congo. During his tenure within the ministry, Ponyo helped change the investment climate of the nation and began enacting newer measures to protect shareholders and boost capital flow to the country. Aware of the magnitude of the task at hand, the government of the Democratic Republic of Congo is working on innovative mechanisms to address the challenges of development in order to propel the country towards accelerated growth. In collaboration with Harvard University, Ponyo gathered with thought leaders from around the world, ranging from professors to government leaders, to help shape policy and debate ideas for sustainable growth. The Congolese government and private sector have worked together to launch the Kinshasa International Economic Forum, an annual event created to discuss lessons learned from successful experiences of other counties on governance and economic growth. In early January of this year, the nation hosted a team of economists and professors from the US and Europe to discuss inclusive growth needed to drive the nation forward. The prime minister understands that future of the Democratic Republic of Congo rests not only on the government, but on a public-private mandate to create opportunities and growth, which can only occur when the rule of law and governance allow for the rights of investors and citizens to be protected. Within his first term as prime minister, Ponyo focused his attention on key initiatives that would help the nation prosper. From bolstering the legal system by implementing investor-friendly regulations, to lowering corporate taxes and decreasing the amount of bureaucracy for starting and running enterprises. The prime minister followed through on his goals to show the world the potential of the Democratic Republic of Congo under proper governance. Taking advantage of this improved business environment, OM Group (OMG), an American cobalt refiner, became the first western investor to work within the Democratic Republic of Congo after the nation’s civil war. In addition to more than $300m in cash flow provided to the nation in taxes, raw materials and electricity, the joint venture between OMG and Gecamines, the state-owned mining enterprise, has created over 400 jobs for the local Congolese miners. The company’s executives praise Congo’s leadership as forward thinking, and advantageous to business and foreign investments. 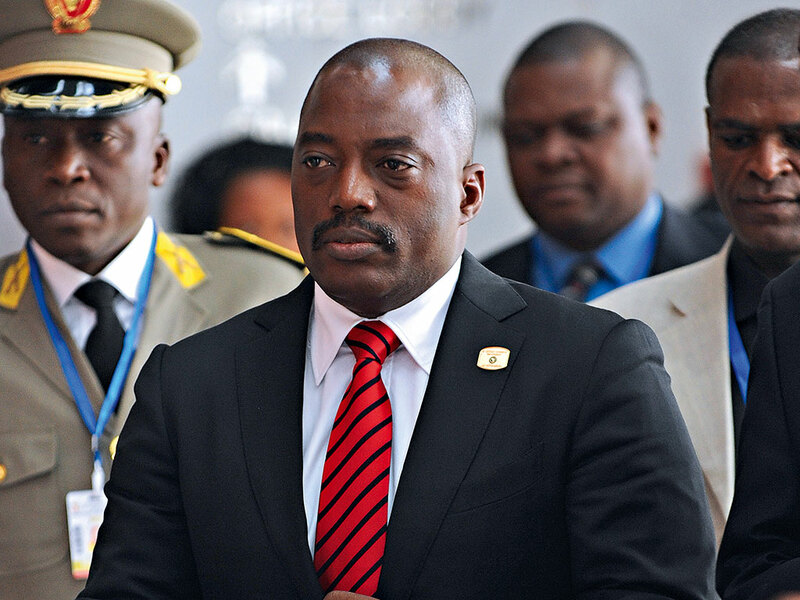 “The business climate in the DRC has improved significantly over the past 10 years since Kabila came to office. He has done a good job, but there is still much to do”, said Steve Dunmead, Vice President and General Manager of OMG. As the Democratic Republic of Congo continues to develop and create a wealth of opportunity for both international investors and its citizens, the development of business-friendly environments is vital in developing the country into the continent’s future superpower. Fostering partnerships, a key aspect of the country’s growth, will be at the top of his list as he continues to work with international partners and development organisations to bring prosperity to the nation. Through improvement of the business climate and development of the nation’s social sectors, the leadership of the Democratic Republic of Congo has proven its uncanny ability to accomplish goals necessary to bring progress. By creating opportunities for the Congolese people and developing an environment to help businesses thrive, Ponyo is fulfilling his pledge to bring a new level of prosperity to the Democratic Republic of Congo. From subtle changes – such as decreasing the size of government – to the implementation of long-term energy frameworks, Kabila and Ponyo are leading the charge to show Africa and the world the true potential of the Democratic Republic of Congo.